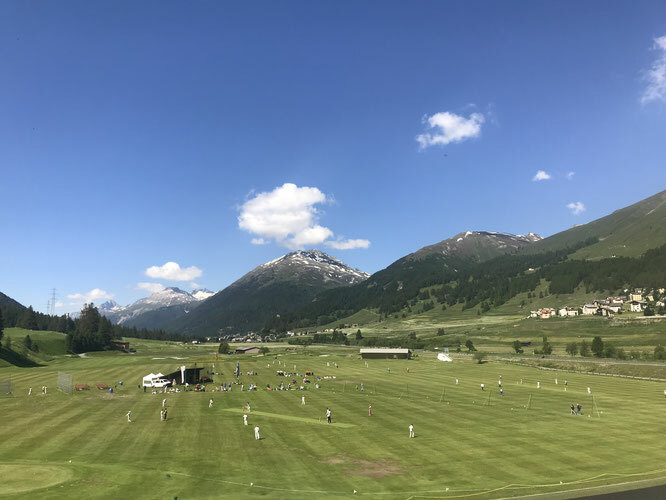 The 13th Swiss Junior Cricket Festival took place on Saturday 16th and Sunday 17th June 2018 at the LAZ cricket playing fields in Zuoz GR. After the previous two year’s tournaments being rain affected, it was a great relief to be worrying about sunburn instead, as blue skies were over Zuoz for the 2018 tournament. As usual the Lyceum Alpnium’s generous hosting of the event and Paul Miles’ support and preparation ensured a fantastic tournament. An unfortunate clash with house moves, school trips meant a number of key players were unavailable and only ZCCC were able to field a full strength side. To ensure a competitive tournament, the players were formed into three teams to compete for the trophy. Many thanks to Ivan for his work as age group director, Danny and Baljit for coaching the teams and all the players for making a very competitive event! Spirit of Cricket - Thomas A (La Chat) for taking 3 wickets in 4 balls despite being a wicket keeper! Many thanks to Lance for his work as age group director. 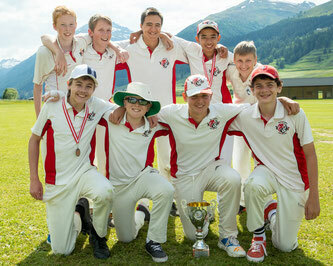 Basel Dragons U15s won the 2018 Swiss outdoor tournament held at Zuoz on June 16 & 17. Three teams competed in the tournament each playing the other twice. The Dragons, helped by Leon and Joshua from the Lyceum school, were undefeated in their four games proving too strong for their opponents from GRYCC + Zurich and La Chat + Gingins. The team demonstrated how their skills had progressed with Max L, Max H, Noah and James W all reaching the retirement score of 25 in one or more matches and the bowlers in good wicket taking form: Noah 8, Eden 4, Jimmy 3, James W 3, Marc 2. In the field, Ray took an outstanding catch on the boundary to dismiss Adam in the final game against La Chat. The best batsman award went to Max L for his 92 runs without being dismissed and Noah was best bowler for his 8 wickets. The result gives the U15s a clean sweep of titles for the year. They are now the holders of the Gingins, Basel and Zuoz trophies. Well done to the team!